An essential equipment after creating microtome sections. Our Island is ideally used for flattening, stretching and drying paraffin embedded sections, all with one device ensuring an efficient workflow. 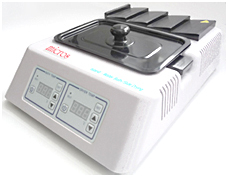 The "Stacking Tiles" styled hotplate with its 4 bevelled levels can take a maximum of 16 slides at once. The stainless steel hotplate is also painted in black, which provides the ideal contrast for easy observation. The water bath and the slide dryer are controlled independent of each other with two separate control panels.